I guess they were about 5-10 years to early with that, shame the economics didn't work out. In stead they have pushed their aging Destiny-class ships (mid 90s design) to their limit, now with the Vista. 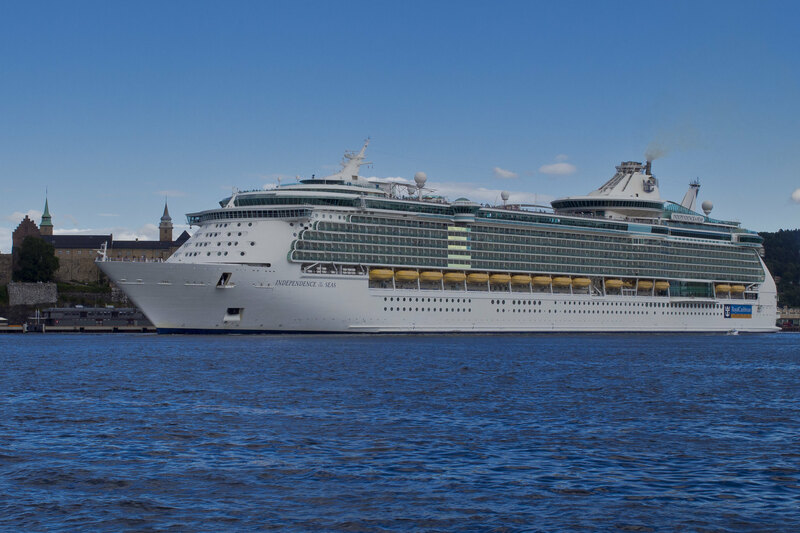 Now their main competitor, Royal Caribbean Cruise Line operates three ships of that size (Oasis, Allure, and Harmony of the Seas, the fourth, Symphony of the Seas is under construction in France). I have to say I don't like the structure they fitted on top of it at the front, it makes the ship look unbalanced, like it's wearing a hat. The original Voyager-class design, before the enlarged and glassed balconies of the Mariner and Navigator, and the front end hat was added, they looked much better I think. The somewhat larger Freedom class is pretty much just a stretched Voyager. This got really close to where I was standing, it was certainly a very imposing sight, also, if you look closely at the area around the funnel you can see the scrubber they added to clean the exhaust, I guess they will tidy that better up when it's due for some heavier maintenance. I've sailed on the Mariner of the Seas and the Freedom of the Seas and I've got to say that both times I was very impressed with the design of both ships. So much so, that for a while I even considered going into school for marine architecture (this was when I was 16 and 18 respectively, before I went to college). To this day I sometimes fantasize what it would be like to work as an engineer in the early design stages of those ships, though I'm really happy working on performance cars instead. Yes, it's easy to think you have all the space in the world to get all the engineering packed into a ship, but in reality it's very intricate. Also, the logistics required to make a cruise go around is quite amazing. I really enjoy cruising as a form of holiday, it's a very relaxing way of seeing multiple places, and there's so much to choose from with regards to activities. That is about the only large passenger ship I really have any interest in sailing on, the rest all look like generic white floating hotels. I know that most people just want to be able to look out the windows and see the ocean or ports of call, but I love ships. I want to feel like I'm actually at sea, something like the S/V Mandalay is more my speed, less about the amenities and more about the ship and the journey. Amen to that, when on a ship I want to feel like the travellers of old, the golden age of steam, back when you actually got on a ship to go somewhere, back when a long journey was a real undertaking and people dressed for dinner.....not a tourist in Las Vegas meets Disneyland. I'll take a cruise when someone finally builds a modern version of the Titanic. In the meantime these overgrown gin palaces can GTFO. Like the Queen Mary II? No I mean an actual, as-period-correct-as-humanly-possible, replica of the Titanic. Various people have talked about it since Kate Winslet pushed Leo DC of a raft but it's never happened. Um, you do know the first one sank right? Yes, I have heard the rumors too, but it is serious money to do such a thing. The real hold back is that the appeal would be for a trip or two, then you(well, most) would want all the amenities that a modern ship offers to kill the boredom. You mean like rollercoasters and 7 swimming pools? That's exactly the sort of crap that ruined travel by ship, turned it from 'travel' to 'cruising'. The Titanic was built to be the Concorde of it's day. It was primarily a means of transportation and the luxury of it was the speed at which you could cross the ocean. The dining rooms, grand staircase, pool, and other amenities were there to help justify the cost for first class passengers. Crossings were generally either boring or horrible, depending on the weather. The Queen Mary II is a modern liner, but they realize that they have to offer something other than a crossing to get people interested. Remember that the Titanic was the height of modern amenities at the time, so to keep with that style, a modern liner needs to offer today's modern amenities. That doesn't necessarily mean water slides and climbing walls, but it does mean some form of entertainment; otherwise is it just a glorified ferry. Not disagreeing with you in any way but with the mystique surrounding the Olympic class liners, Titanic in particular, I am sure there is a business case to build one and have her ply her way between Southampton and New York. Sure half the people on there would be nouveau riche Chinese middle-class tourists and the tickets wouldn't be cheap. That seems like a horrible plan. What other disasters do you want to cheapen by turning into a carival ride? Hey I wasn't saying it was right, just making the case for a profitable business venture. You can't hide the fact that the Titanic holds a particular fascination globally in a way that similar and in some cases worse tragedies simply don't. And bear in mind the Chinese are building a full sized replica of the Titanic that won't go anywhere but will sit in a lake at a theme park for people to visit and one presumes dine and sleep in. Of course being a Chinese knock-off it won't be as reliable or well built as the original and the menus and signs will be full of typos. otherwise is it just a glorified ferry. Not disagreeing with anything but even ferry's have ammendities equaling or surpassing that of say Titanic these days, granted you are only on those for no more then 24 hours (in the civilised world at least) but what do you really need besided a restaurant, a pub and some 5-the rate entertainer making a fool of himself on stage, I think it's an exuisitly relaxing, if slow, form of travel.